This article first appeared in Personal Wealth, The Edge Malaysia Weekly, on July 3, 2017 - July 09, 2017. The stocks of export-oriented companies present good buying opportunities for investors this year as global companies have yet to realise the advantage of a weak ringgit, says Rudie Chan, chief investment officer at Eastspring Investments Bhd. When they do, there will be more procurements of Malaysian products and services globally. Hence, investors can expect the earnings of exporters to improve further. “The ringgit is still weak and it takes time for the market to realise that our currency has lost more than 20% of its value in the last two years. When that happens, there will be more people buying more goods from Malaysian exporters,” says Chan. Year to date, the ringgit has been one of the best performing currencies in Asia. It has strengthened by more than 5% against the US dollar. However, the local currency is still weak. Chan says exporters are expected to benefit from improving global growth and trade flows. There are also fewer political risks and better market sentiment than last year. “We still like the glove players, for example. The locally based technology companies have been doing well, but their stock valuations are not so appealing now,” he says. The improvement in global growth can be seen in the revised figures of organisations such as the International Monetary Fund (IMF) and the World Bank, says Chan. The IMF forecasts global growth of 3.5% this year, compared with its projection of 3.1% last year, while the World Bank expects growth of 2.7%, up 0.3% from its forecast last year. Apart from export stocks, he also likes banking counters as their valuations are looking attractive. “The global and local economies are recovering. The [earnings] performance of banks is going to improve, even though the market has underpriced their growth prospects in the last 12 months,” says Chan. The banking sector’s performance is underpinned by improvements in domestic consumption and public and private investment. Infrastructure is another sector that Chan likes due to the upcoming general election, which is expected to take place as early as the fourth quarter of this year or by the second quarter of next year at the latest. “Announcements on government infrastructure projects have already been made. We expect to see a lot more infrastructure works and spending to come through and these things drive stock prices up,” he points out. But some industries have been facing a lot of headwinds and competition. “The oil and gas industry is still facing headwinds from weaker prices and capacity issues while the property sector is not exactly booming and telecommunications companies are still locked in a very competitive environment,” says Chan. Earlier this year, market players noted the possible risks to global economic growth emanating from US President Donald Trump’s anti-globalisation rhetoric. However, it has toned down significantly since, says Chan. Thus far, the great wall between the US and Mexican borders and the trade war with China have not happened, nor have other protectionist and anti-trade policies been implemented. Chan does not believe a global financial crisis will occur this year. In fact, the global economy is on a path to recovery, he points out. “If you look at the Organisation of Economic Cooperation and Development’s leading indicators and the Purchasing Managers’ Index figures, they have been trending down for the last couple of years. Since the middle of last year, we have seen a very strong uptick [in these indicators],” says Chan. He says the world’s major economies, such as the US, China and Europe, have been doing fairly well. This has contributed to the higher global growth this year. At the same time, the global economic risks have subsided. “There are fewer risks this year compared with last year. It has been a more peaceful year with fewer uncertainties,” says Chan. The Brexit negotiations have begun despite UK Prime Minister Theresa May and her party losing their overall majority in parliament in the recent snap election. The result was not a big surprise to the market compared with the Brexit referendum in June last year, says Chan. On June 14, the US Federal Reserve had its second interest rate hike this year, despite the core consumer price inflation rate receding to 1.7% year on year in May, which was below the central bank’s target of 1.9%. This sparked a debate in the market on whether the Fed is raising rates a little too quickly even as the US economy recovers. 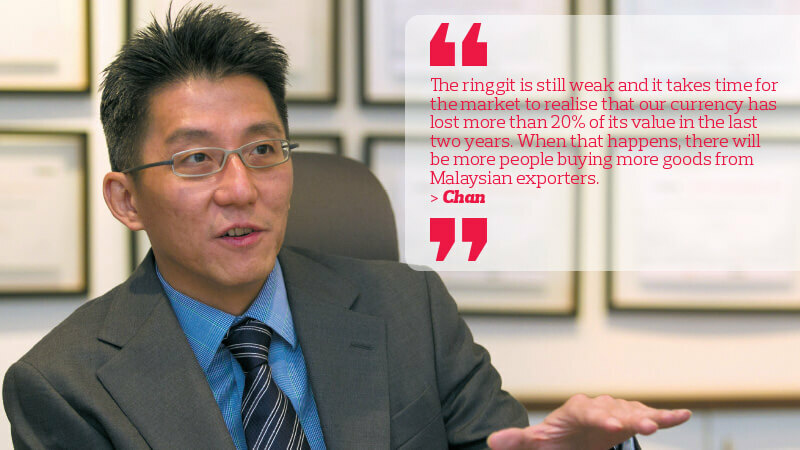 Chan has a positive outlook on the Malaysian economy. He says the country’s gross domestic product (GDP) is expected to perform better than last year on the back of improved global growth, trade flows and reduced political risks. Domestic consumption has also improved and there is more capital expenditure. Crude oil prices have remained low at between US$40 and US$60 a barrel. Chan says as long as prices have stabilised, this price range is not necessarily a bad thing for the country. He expects oil prices to continue being traded rangebound until the end of the year. “It is good for the private sector and the man in the street as it will keep the cost of doing business and inflation lower. Also, it is still slightly above what was forecast in the national budget, so our national oil company is still making a decent profit, though not as high as before,” says Chan. He expects more investment inflows into emerging markets with an open economy model, such as Malaysia, on the back of improved global economic fundamentals, higher growth space and relatively lower valuations. “I think fund flows will continue to come in and remain stable, provided that there is no major disruption on the global economic front. While geopolitical risks are currently under control, we are keeping an eye on any changes to the increase in global interest rates. If the Fed deviates from its path of three rate increases this year, it will disrupt the flows into emerging markets,” says Chan. As at June 23, the FBM KLCI was up 8.64% year to date while Hong Kong’s Hang Seng Index was 16% higher. Eastspring is keeping an eye on the domestic consumption and inflation figures, says Chan. While domestic consumption is growing strong, the figure could be deceiving as the increasing costs have not been taken into account. “It does not take into account the base effect, which is the cost. Yes, consumption goes up in nominal ringgit terms and you are paying more to buy goods and services [which contributed to the stronger private consumption number]. But at the same time, restaurant owners and businesses say they are experiencing tighter margins,” says Chan, adding that the fund house is also keeping a close watch on the inflation figure as it could affect Bank Negara Malaysia’s interest rate decision. Rudie Chan, chief investment officer at Eastspring Investments Bhd, has more than two decades of experience in the investment industry. Before joining the fund house, he held senior investment roles at global insurance companies such as AIG and Great Eastern Life Assurance. Chan is a Chartered Financial Analyst. He also holds a Bachelor of Commerce degree from Monash University and a Master of Commerce in Finance degree from the University of New South Wales, Australia. Chan began his career as a sell-side analyst. He says he was lucky to join the investment industry in the 1990s when the country went through a boom and bust. The economy experienced significant growth under then prime minister Tun Dr Mahathir Mohamad’s industrialisation policy before succumbing to the Asian financial crisis in 1997/98. “The learning curve back then was steep and it taught me the importance of investing in cycles and to be very disciplined when investing. Not only do you buy good stocks when they are low, you also have to be disciplined in taking profit,” says Chan. As a value investor, he understands economic cycles, buys undervalued stocks and sells them when their prices have risen. Over the years, he has adhered to this principle and made many correct calls. “It is not hard to get most of your calls right, provided that you put in the necessary effort to do your research. This and experience help you make good judgements,” he says. Islamic small-cap stocks are expected to outperform this year, mainly because global growth is recovering and there are fewer global risks, according to Eastspring Investments Bhd chief investment officer Rudie Chan. “As at June, small-cap stocks had outperformed the large caps. Last year, when the economic environment was difficult, large caps held up better. Broadly speaking, I expect small caps to continue their outperformance this year,” says Chan. Meanwhile, government-linked companies, which have supported shariah investments by providing a lot of liquidity to Islamic stocks, are expected to throw more funds at the Islamic small-cap space. This is in line with the two-year Mid and Small Cap (MidS) Research Scheme launched by Bursa Malaysia and the Securities Commission Malaysia in May. Under the scheme, 22 research houses will produce reports on 300 listed companies for a period of two years. This is aimed at spurring the vibrancy of the local stock market, especially within the small and mid-cap space. Eastspring launched its Eastspring Investments Islamic Small-Cap Fund in May. It will invest a minimum of 70% of its net asset value in shariah-compliant equities and equity-related securities and a minimum of 1% in Islamic deposits or liquid assets. The minimum investment amount is RM1,000. There is also a sales charge of up to 5.26% and an annual management fee of 1.5%. CEO Raymond Tang was quoted in reports as saying during the launch of the fund that some small-cap counters were trading below their intrinsic value and that it presented buying opportunities for the fund. “The small-cap segment is under-researched and undeservingly traded below its intrinsic value. Eastspring will use this opportunity to unearth these small-cap companies and exploit the pricing inefficiencies,” he said.